When it comes to sharing engaging content, social media marketers understand the importance of compelling visuals. But how do you efficiently manage your visual assets to ensure your entire social marketing team is able to organize, find and share your brand’s creative? Cataloging your brand’s inventory of visuals is overwhelming and difficult to scale. In fact, only 27% of marketers have a process in place for aggregating, organizing and managing the visual assets that are being used across their organization. 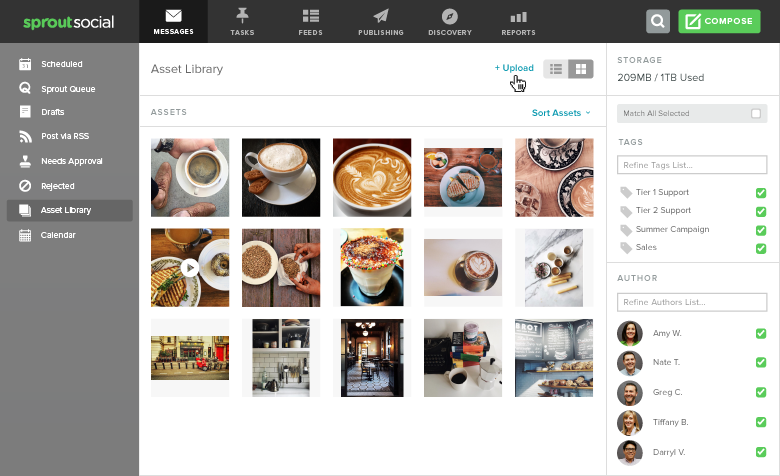 Today we’re excited to announce Sprout’s Image Asset Library (available in Advanced plans), an update that simplifies collaborative publishing and asset management. 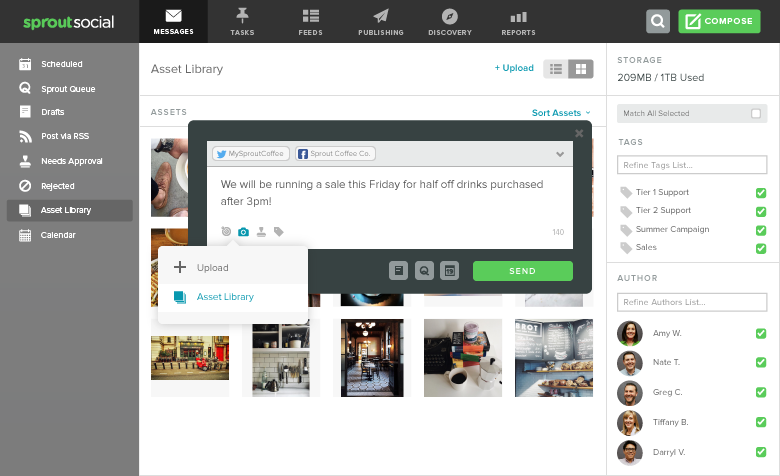 The Image Asset Library helps your team plan, schedule and publish high quality, engaging social media content. With custom permissions, logical organization and seamless integration with our built-in image editor and Compose window, this update empowers your team to stay agile and work smarter, not harder. Prior to your first upload, an account owner or user with “manage profiles and permissions” must configure your Assets Library settings. These settings define how users can view and interact with your visual assets. Depending on a user’s access level, images can be uploaded and downloaded, edited with our integrated image editing tool, tagged for organization using our universal tagging system or sent to Compose for publishing. Collaborate across teams globally: Easily maintain one place for your entire team to store, edit and publish images. Organize your images: Use our tagging and filtering functions to always find what you need. Maintain brand consistency: Ensure that all of your posts are on brand by providing team-wide access to the most up-to-date images. Streamline your publishing process: Quickly choose stored images as you create and schedule content within our Compose window. Repurpose images for multiple campaigns: Work more efficiently and boost your engagement by repurposing compelling content from your asset library. Sun Tan City, a national franchise with over 270 salons across the United States, has a robust social media presence that includes over 600 profiles across four social networks. Katie O’Connor, Associate Director of Digital Engagement at Sun Tan City, recognized the benefits of the Assets Library right away. “It’s been a tremendous asset to the speed and accuracy of our brand’s post images,” O’Connor said. I can quickly find the appropriate image we need without digging through folders on our computer or past emails. 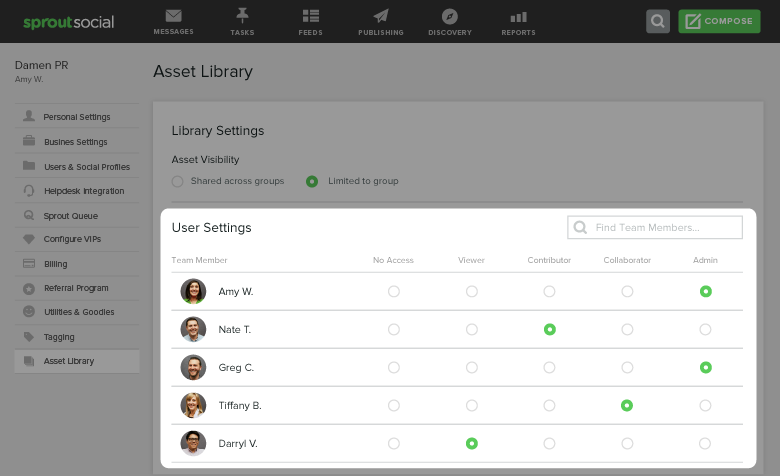 The tag, filter and search tools within the Assets Library make it easy for the team to identify the correct creative for each post. It also provides the franchise’s social media marketers with the guidance they need to better understand which social campaign or brand initiative an image is associated with. This has streamlined Sun Tan City’s workflow and has helped ensure all of the brand’s social profiles remain consistent. “I am thrilled with the tag manager. I have already uploaded dozens of images and this helps me find the specific one I need and get that post sent,” O’Connor said. With 71% of online marketers incorporating visual assets into their social media publishing strategy it’s clear that your brand’s library of content is growing at a rapid pace. We hope this update makes it easier to streamline your team’s communication and stay organized. Let us know what you think! Comment below or reach out to us on Twitter with any questions. In the meantime, stay tuned for more updates to our publishing suite coming soon.